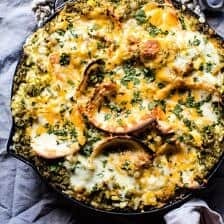 Sharing my favorite simple one pan autumn chicken and wild rice casserole recipe with you guys today! I share a ton of recipes here on Half Baked Harvest, but I don’t often share more traditional, homey ones like this wild rice casserole. It’s odd because my family loves traditional food. Meaning lots of chicken and rice, tacos, and pasta… basically anything on the more bland side of the dinner spectrum. While I do share those types of recipes, normally I’ll put some kind of spin on them. I love flavor, nothing bland over here! Today though, I am going the more classic route and loving it. This is cozy, healthy, filling, and all things delicious. It’s not a bland casserole in any way, just simple, feel good kind of food. What? Always got to have a little cheese. I don’t know if you guys remember, but around this time last year I shared a cream of mushroom chicken and wild rice soup that my family and I loved. This casserole is sort of similar flavor wise, but just a lot less soupy and much heavier on the wild rice. So just what inspired me to make this casserole? Well, like most of the more classic recipes I share with you guys, my mom inspired this one. She’s always loved chicken and wild rice casserole, but she grew up on the ones that are canned soup based. I wanted to create a version that was just as tasty, but a little healthier. Fortunately, it was a pretty easy task and it turned out really delicious too. 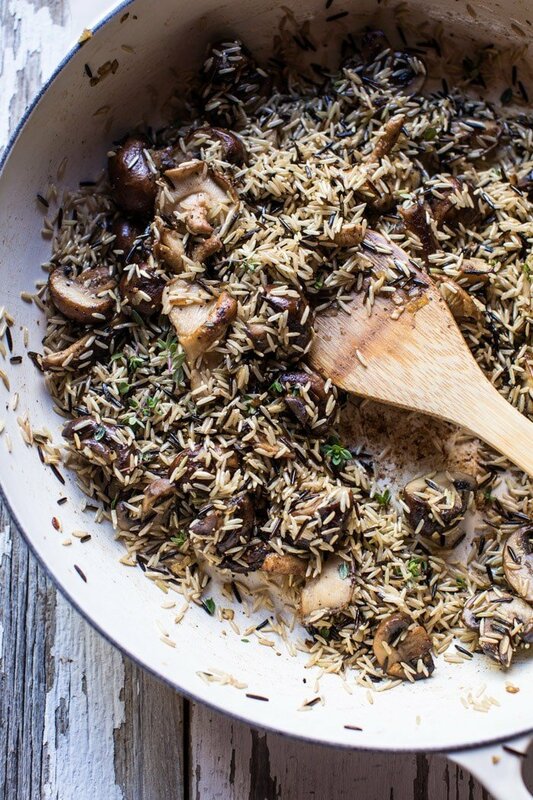 Start off by cooking up some mushrooms, add some apples, wild rice, and chicken. Next stir in some broth and a splash of wine (you know, for good measure). Cover and simmer until the rice is tender. Then stir in some spinach, top with cheese, and bake until golden. Really doesn’t get much easier, and I love that this dish is an entire meal…carbs, protein, and veggies all together in one dish. This is truly a recipe made for busy nights. Also, if you’re wondering about the addition of apples, I know it may seem a little odd, but it’s the perfect touch of sweetness for this extra savory recipe. Plus, I love the combo of apples and Gruyère cheese, so good. Double also? if you wanted to add another layer of flavor, I would highly recommend topping the dish with thinly sliced prosciutto before baking. The salty flavors would be delicious with the apples, mushrooms, and rice. And that’s it for me today guys. Shortening up the post a bit because I experienced my first migraine today (it’s Monday night as I am typing this) that has left me extremely out of it. The headache started a couple of days ago, but hit its high today and woe, I was not ready for it at all. Fingers crossed I’m on the up and up from here. Hoping you’re all having a great week, and happy Wednesday! 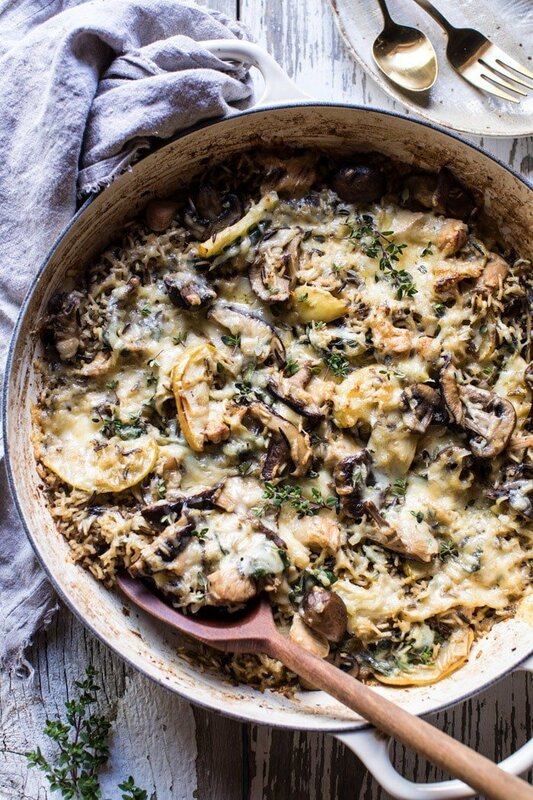 This autumn chicken and wild rice casserole is cozy, healthy, filling, and all things delicious. Best part? It's all made in just ONE pan. 2. Melt the butter and olive oil in a large, oven safe skillet over medium heat. Add the onion and cook for 5-8 minutes, stirring often until the onion is soft. Season with salt and pepper. Add the garlic, the cremini mushrooms and the wild mushrooms, cook another 5 minutes or until the mushrooms are caramelized. Stir in the apples and thyme and cook another minute longer. 3. Pour in the 2 cups chicken broth and the wine and bring to a boil over high heat. Stir in the rice and chicken, cover and reduce the heat to low. Simmer for 45-55 minutes or until the rice is cooked, if needed, add the remaining 1/2-1 cup broth if the rice feels a little hard still. Remove from the heat and stir in the spinach. 4. Sprinkle the cheese over top the rice and transfer to the oven. Bake for 10-15 minutes or until the cheese has melted. Remove from the oven and serve with fresh thyme. Enjoy! ps. having leftovers of this dish for dinner tonight, because comfort is totally needed right now. 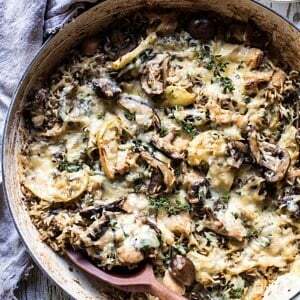 One-Pot Creamy French Onion Pasta Bake + Video. Yes, it so is! I hope you love this Ruth! Thank you! 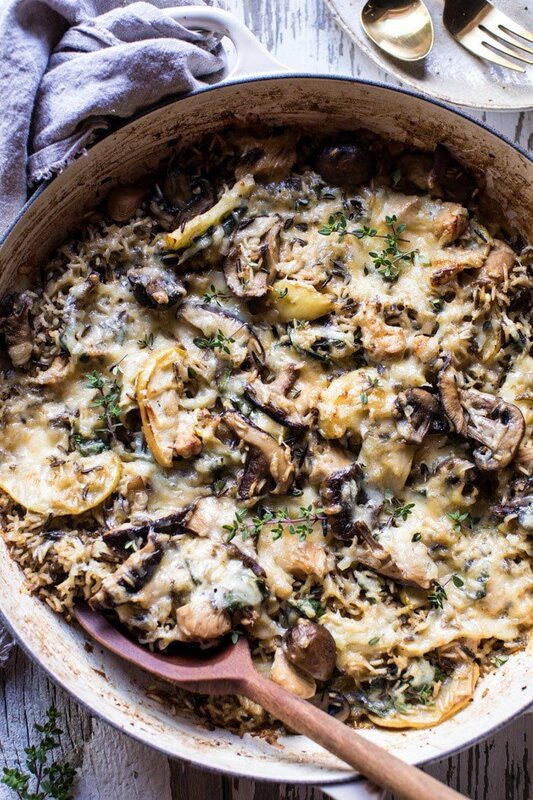 This casserole has my name all over it!! Once I get back North (home) this recipe will be one of the first!! I have wild rice waiting for me. I’ve stopped purchasing canned cream soups — the garbage in them euwwwwww! I hope your migraine is gone! gone! gone!! Not fun trying to do anything. Take care! I hope you love this Marisa!! Much better than the canned soups in my opinion! Thank you so much! Haha yes! Thank you so much Amanda! Ultimate comfort food! Love the flavors! One word of advice for your migraines from someone that has had them for over 30 yrs. and has a family history of them, take Excedrin Migraine and drink some Coke. The caffeine helps speed the effectiveness of the meds. I am one of the 20% of migraine sufferers that gets the “aura” in which everything is spinning but at first second I start thinking I am getting a headache I take this and within 20-25 minutes I am starting to feel better. I was on prescription meds. for awhile but this works better without the side effects. Good luck to you! It’s not a “club,” I would wish on anyone. Thank you so much for this, I will try this out! The recipe ingredients call for 2 cups of wild rice, but all the photos show what looks to be a White and Wild Rice blend, of some sort, Also, the cook time, once the ‘wild rice’ has been added is only 30 mins and most wild rice takes longer than that to cook to tender. 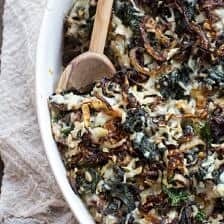 I am just trying to verify that it truly is 2 cups of all Wild Rice for this recipe or is there a blend that I should be using? I am looking to make this over the coming weekend, which is why I am asking for clarification. Thank you and this looks wonderful! THAT WAS MY QUESTION, TOO. PHOTOS DO LOOK LIKE A RICE COMBO. AND COOK TIME WOULD BE A FACTOR. AN ADDED QUESTION: WHAT TYPE OF WILD MUSHROOM DO YOU FAVOUR ? THIS LOOKS SO GOOD !!! MY DAUGHTER & BRO-IN-LAW SUFFER FROM MIGRAINES & USE SOMETHING CALLED RELPAX … WORKS GREAT IF YOU CATCH THE MIGRAINE EARLY. BEST REMEDY MY DAUGHTER HAS EVER USED OVER HER 20 YEAR MIGRAINE HISTORY. This looks amazing. Once I get my oven fixed it’s definitely going on the “to cook” list right at the top. Awesome! I hope you love this Julie! Thanks! So sorry about your migraine! While traveling!!!! Hoping you’re feeling much better and that you never have another one. Can’t even tell you how much I am enjoying cooking from your book! I am so glad you are enjoying the book Kim! Thank you so much! I’m not a big fan of wild rice, but this looks delicious. How would you modify the process to use risotto or another kind of rice (maybe basmati?)? Are you sure you BROILED this dish for 10-15 min??? That seems WAY too long for anything under the broiler (?) I have a simliar recipe to this one, and i just bake it at 350 degrees for 20 min, which I will probably do after I try this recipe out. Sounds really good! Oh, and you put the chicken in RAW with the rice at same time, correct? Sorry that was a typo. All fixed. Enjoy the casserole! Your bit about your family made me literally laugh out loud. I can’t tell you how many times my mom or I will make something for dinner and my dad moans “why can’t we just have something NORMAL”. 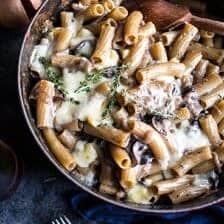 I will never apologize for adding a little flavor and excitement to supper 😝 This recipe though looks right up his alley with one exception, he HATES mushrooms. Do you have a mushroom alternative you could suggest or do you think I can just leave it out all together?? Receita boa demais adoro frango caipira tem um sabor mais natural, bem original. Obrigado! Estou tão feliz que você aproveite isso! What’s a good substitute for Gruyère cheese? My local grocery store doesn’t seem to carry. Looks amazing, can’t wait to try. Just to clarify….the chicken added with the rice is raw? Also, you wouldn’t really broil the dish for 15mins, would you? Thanks Tieghan. I’m sorry about your migraine earlier this week! Hopefully you haven’t had another one since, and your trip to LA is going well. 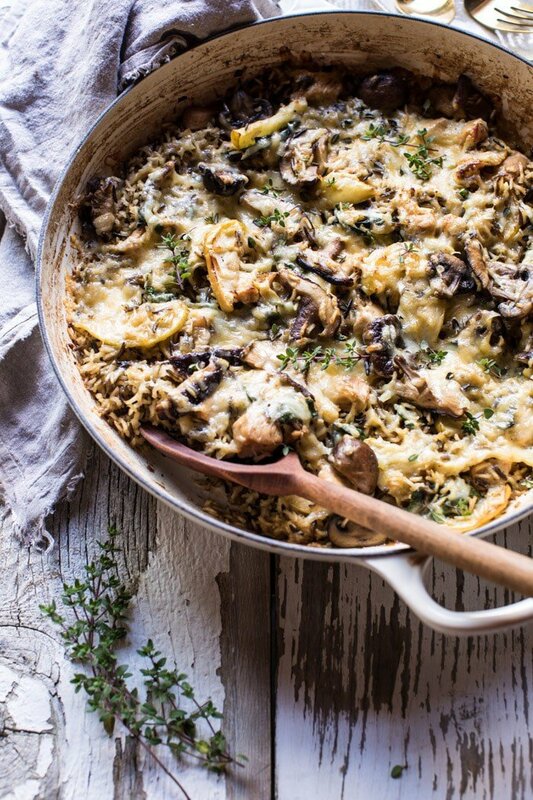 This casserole looks lovely– nice and comforting. Also, do you have any wild mushroom recipes or ideas? I often want to try them but not know what to do besides just roast with some veggies and I also don’t know much about them. 😅 Anyways, this casserole looks like a lovely fall dish. I’m looking forward to hearing how your trip went and hope you’re having a nice time! Hey Kristin! Thank you so much, I am having a great time! If you go up to the search bar at the top right corner of my page, you can search wild mushroom and see all the recipes! I hope this helps! Very tasty. Next time I will double the mushrooms and apple and omit the chicken. Also, wasn’t sure why the oven was preheated to 400 when only the broiler was used. 5-7 minutes was enough to melt the cheese. As always, THANKS Tieghan! I am really glad you liked this! Thank you so much! Would this recipe still work if I substituted chicken thighs instead of bite size chicken breasts? Anything I would need to change? I used chicken thighs (i don’t like chicken breast) and it turned out great. Made this last night. It took WAY longer than 30 minutes to cook all the broth down. More like an hour. Also, why is the oven preheated to 400 if just the broiler is used? Ended up just putting it in the 400 degree oven to melt the cheese. It all turned out to be delicious, but I’ll cut down on the amount of broth used next time. Thank you for sharing. Lovely dish. I did cook the wild rice in broth before adding it to the pan along with what broth was left over in the rice, plus white wine. Sauce was amazing, It’s all about the mushrooms. The apple is a MUST! Gruyere is a staple in my fridge, so it was the icing on the cake! This is my second recipe and I am really happy, Note: I cook for one, so I have to pare down the amount of ingredients as I see fit. I am so happy you loved this Karen! Thank you so much! Wild rice definitely took longer to cook. Also, mine came out quite watery. Recommend cutting back on amount of liquid. Or cooking the rice longer as the edited recipe states. Sorry about that Danielle! I hope this still turned out great for you! A delicious and super easy dish to make! I substituted some ingredients to accommodate my garden bounty, pantry and larder … leeks, kale, shiitake, red wine, purple rice, asiago cheese. I made it in my Le Creuset and kept it on the stove. Makes a lot of rice but thankful for the leftovers. I’m just going to add more kale, reheat and serve! Awesome! So glad you liked this and it will be great as leftovers! Thanks! I read all the comments and still can’t totally understand – is the rice cooked or uncooked when added to the pan? Hi! The rice is uncooked when added. Please let me know if you have any other questions. I hope you love this recipe. Thank you! Just ordered your cookbook! Love your recipes and I’m going to make this one! I just have to say you might want to clarify you used a wild rice blend because at least here in MN where we harvest a lot of it, wild rice is only the dark brown kind, not blended with any other type of rice. I think using all wild rice may give the recipe too strong a flavor. Just my 2 cents! Thanks! I am so glad you ordered the book! I hope you love it Lauren! Thanks so much! I consider myself a fairly accomplished cook. This recipe did not work for me. Too much broth. I also used pure wild rice which didn’t turn out as good as a brown/wild rice blend would have (as the recipe above used – in fact, based on the pictures, it looks like 80% brown rice and very little actual wild rice). Finally, despite copious amounts of cheese, the dish was simply bland. My family refused to eat it! Hi Sam! I am so sorry this dish did not work out for you. I hope you try some other recipes on my blog and enjoy those! This looks so great! i love casserole type dishes. Do you think it would work to do steps 1-3 then put it in fridge and add cheese and finish cooking at a later time (like 1-2 days later)? Thanks! Made this last night! I’m not keen on warm fruit, so I just added rosemary instead. LOVED it! The rice that I bought required a lot more broth and cooktime so I just let it sizzle away. I also chose to cook this with chicken thighs. Super yummy and easy. It’s earthy and delicious. I think it would be lovely with a little cream or cream cheese as well–although it’s already a pretty heavily, earthy dish. Thanks! I am so happy you liked this Emily!! Thank you! I am so sorry you had trouble with this, but I am really glad it still turned out okay. Thank you! Husband and two kids three years old and one in the half. Everyone loved it. I am so glad I doubled the recipe so we have lunch and dinner tomorrow already to go! That is amazing! Thank you Eve! I really wanted to make this because I love so many of the flavors represented and I love one pot meals. I am wondering if it would be a success if I used jasmine rice and chopped chicken thighs versus breasts. I think it would have tasted more moist (in my opinion) with those subsitutions. But that is just my tastes. 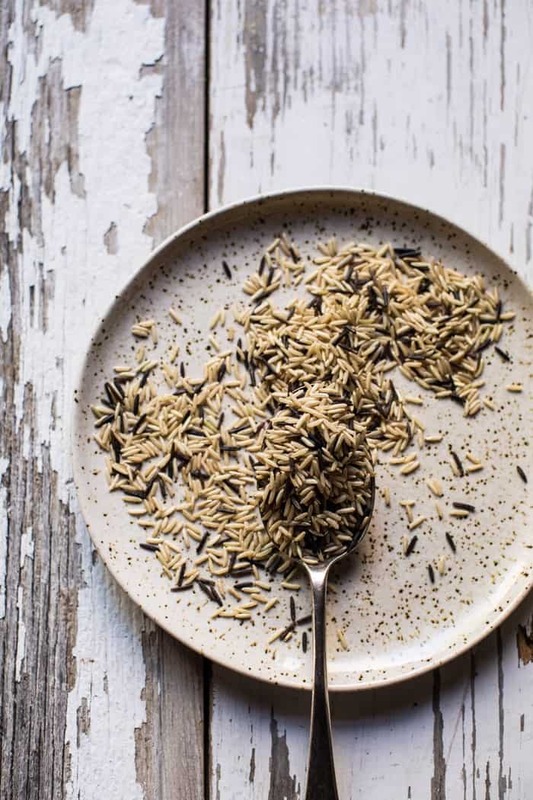 I think if you love wild rice, this will be a big hit in your house! Wondering if this recipe would work in a slow cooker?? by the way, the photography on your site is awesome. Thanks so much Matt! I am really glad this turned out great for you! Love this for a cozy (and easy!) weeknight dinner! This recipe was super yummy! I somehow overcooked the chicken and it ended up a little on the dry side, but the flavors were delicious and perfect for fall. Love that its all in one pan! So easy! I am glad you still enjoyed this! Thanks Carla! Would suggest browning chicken, maybe with onions. My apples coked up and flavor was lost in rice. Maybe thicker slices or adding just before rice is done. Loved addition of Spinach. And cheese and browned prosciutto really topped off dish. Do i cook the chicken before using it in the recipe? Hi Tieghan, I made this over the weekend and it was really lovely! There was a small portion left over which my husband had for lunch the next day and it was just as good – so a great recipe for making extras! I am actually vegetarian so I made it with Quorn chicken pieces instead of real chicken. I am not sure if you have Quorn in America? It is a great substitute for meat, it is made from mycoprotein. Not sure what that is but it tastes nice! I use Quorn mince as well in things like spaghetti Bolognese. 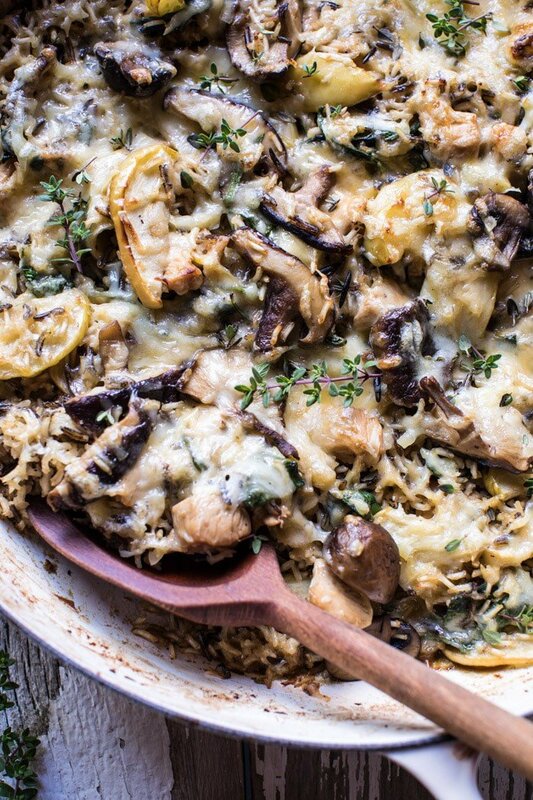 The flavours in this casserole were delicious – thank you! Hi Liz! I am so happy you loved this recipe! Thank you!! The only problem with this recipe is that I would not want to share with 5 other people. I would want to eat it all myself! Haha I am so glad you like this and I hope you enjoy it, thank you!! Wha could I sub for the chicken to make this vegetarian? Sundried tomatoes? Celery? Something else? This is on the menu for later this week. Wild Rice is a really fun ingredient. I have made this twice and it is truly wonderful. A perfect comfort meal for when the cold winds are blowing outside. Yes! I am really glad you like this recipe Patti! Thanks! Love this and will be making it tonight… however in the ingredient list you name spinach but then never say when to add…. after mushrooms? Just made this tonight and it turned out great! I halved the recipe, but wish I had put in the full apple. Delicious and perfect for a chilly fall evening! To clarify, add uncooked chicken and rice at the same time prior to covering? It turned out pretty good. After reading the comments, I worried that it would be a little bland so I added 1/2lb of browned sausage and did half chicken breast/half chicken thighs. Next time, I would add more Apple— the flavor didn’t really carry. Yes, the rice took longer but it was worth it. I am so glad it turned out great for you Laurin! Thank you! This dish was amazing! My husband and I ate fore a couple days and loved it every time! Perfect for warming up on a cold day! Yes! I hope you love this! Thanks Jill! I made this using leftover turkey and it was great. Just added the turkey same time as spinach. Much better than pot pie hubby was craving! I am so glad you and your husband enjoyed this Cathy! Thank you! Delicious! Added a pinch of red pepper flakes and some fresh rosemary. Did add the prosciutto on top. It added a lot but didn’t get crispy. Should I have cooked it first? This recipe is AMAZING! I made it for a client (I’m a personal chef), and it was a big hit- I was drooling over it too wishing it was for me! Yum! That is AMAZING! Thank you Emah! I am a bitter supertaster, so vegetables are usually a no-go, and the texture in fruit usually makes me wig out (although I love the taste). But I made this tonight and my boyfriend and I thought it was just delicious. Granted, I’m not going to make another vegetable thing for another week or so–but hey, progress! Baby steps. That is so great! I am really glad you enjoyed this Gwen! My husband and I had this tonight. It was delicious and easy! thank you for the recipe! So I see that the oven is to be preheated at the beginning but then the instructions say to simmer for 45 minutes then bake with the cheese. Am I understanding correctly that the simmering is to be done on the stovetop? If so can I bake it instead? Yummy…. thank you for sharing recipe. I will definitely try this one. Thank you so much Sonia! I am so glad you loved this!! This was so delicious and very easy to make. Really big hit in our household. Thank you Sheila! I am so glad you liked this! So if it helps anyone, I actually tried this recipe. A lot of the time I see comments about “looks so good” but rarely those who have tried it. I give this 2 big thumbs up. It truly is comforting, and I like the whole ingredients. I have a recipe that tastes almost just like this but calls for a bunch of powder mixes and additives and chemicals you cant pronounce…I’m very pleasantly surprised with this! So so yummy! I used portabella mushrooms because there weren’t any of the others available in organic and it’s just so yummy!! I am so glad you enjoyed this recipe, Liz! Thank you! Made this dish for a church potluck. Absolutely amazing! The apples added such a unique touch. I highly recommend making this recipe! Next time I will add more mushrooms so there’s a better mushroom/chicken/rice ratio. . .Also, the rice took about 25 minutes longer to cook, which made the apples cook down more. Next time, I’ll add the apples a littler later on so they don’t break up. Thank you for this delicious recipe! Can’t wait to make it again! Hi Karly! I am so glad you and your church enjoyed this recipe! I am so happy to hear that! I cooked this for 25 more minutes than you suggested and used more than twice as much liquid and the rice was still rock hard. I think something is off in your calculations or you maybe used a different type of rice. Just thought I would let everyone know. Hey Aly, what kind of rice are you using? I haven’t had other readers have this issue, so wondering if you are using something different? This looks delicious! Is the chicken raw or cooked when you cube it? We just finished eating this for dinner (with both of us getting seconds!) and I’m already so excited to have leftovers for lunch tomorrow! Delicious!! Definitely will be making again. Perfect cozy Fall dinner. Made this for dinner tonight ! .My picky eater…enjoyed it . .My wild rice hater …. loved it, sad he couldn’t eat more (had to save dessert room ).
. Every other guest tonight LOVED IT! Easy to make and all flavors work amazingly together, it will for sure be made again..and again..and again!! Thank you so much Aleisha! I’m wondering when to add in the 2 cups of baby spinach. I see it in the ingredient list but not in the instructions. Thank you. You’re fine! I hope you love this recipe! Thank you! Fantastic meal. We love it. Should it be covered or uncovered? This is a great recipe. I sort of went backwards on it, but it came out great. I hope your Migraines are minimal. Keep sharing. 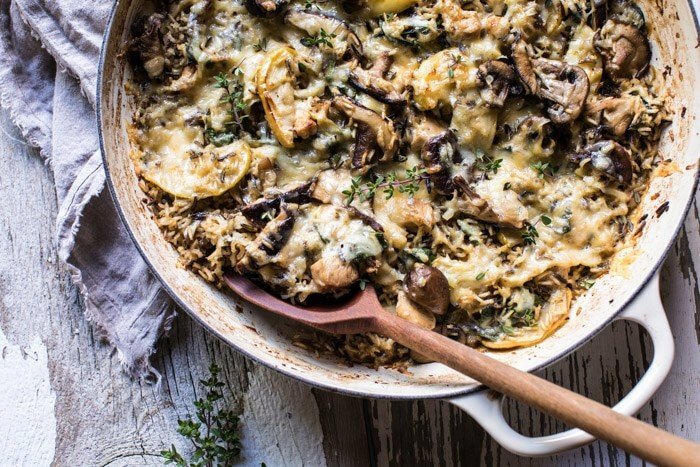 This casserole looks delicious, I love mushrooms! 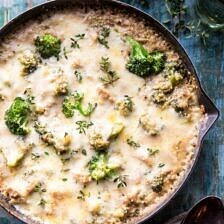 I’m having friends over for a weeknight dinner party and I was wondering if part of the recipe can be made the day before and then baked In the evening after work? Thanks!! I just made this recipe tonight. It was delicious, but the chicken turned out dry, any suggestions? ( I cooked the dish for 50 min) I was thinking of adding it 30 minutes after putting the rice in…thoughts? Also next time I cook this, I’m definitely going to double the amount of mushrooms!